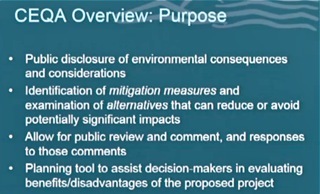 The Costa Mesa City Council met for a Special Council Meeting Tuesday night with a single subject on the agenda - the 2015-2035 General Plan and Environmental Impact Report. Well, MOST of the council was there. Lamest of lame ducks, Gary Monahan, was a no-show again. 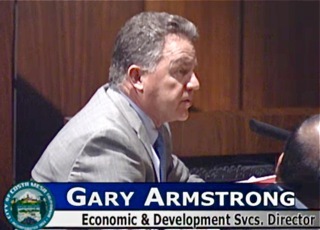 Director of Development Services Gary Armstrong kicked things off with a short introduction, then handed off to consultant Laura Stetson from MIG to get things rolling. She has been the point person in this process for the nearly four (4) years it has taken us to reach this point. 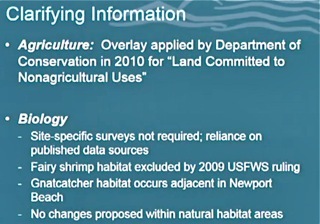 I'm not going to attempt to paraphrase her - I'll just let her slides do the talking. Armstrong then took the ball back and went through segments of the staff report, HERE. This document, and the attachments, makes for some formidible reading, but many answers are there. 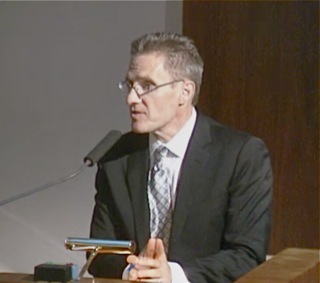 Next up was consultant Daryl Zerfass of Stantec, who helped with the transportation elements of the General Plan. His charts were too numerous and too difficult to read in this format, but can be found in the staff report. 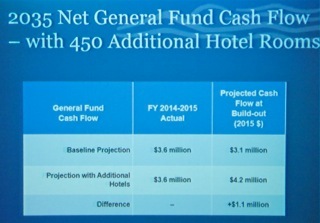 Then came Roger Dale with a refresher of the Financial Impacts. 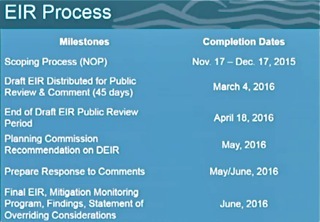 Up next were Public Comments. To his credit, Mayor Steve Mensinger had a change of heart and decided to allow speakers three (3) minutes instead of two that was announced. Good for him. Twenty-six (26) people spoke over the next sixty-five (65) minutes, but I'm not even going to attempt to cover all of them. Please watch the video of this meeting for all the details. Here are some samples, though. 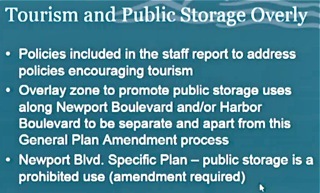 Beth Refakes questioned the overlay zone on Harbor Boulevard and wondered about the revenue generated by public storage units. 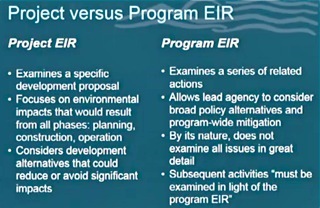 Because mention was made of comments to the EIR being lost - at least temporarily - she suggested a more refined system be used to manage comments in this process. 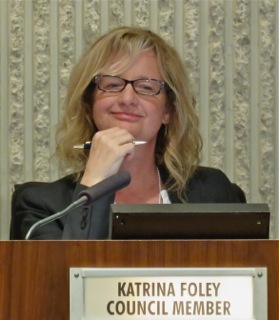 An interesting sidebar - Councilwoman Katrina Foley asked her as she left the podium what would her druthers be for Harbor Blvd. The question caught her off guard, so she danced around it. 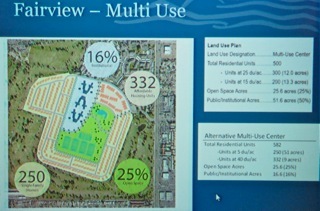 Jay Humphrey provided a little slide show using several of the images projecting what certain specific sites throughout the city may look like if development plans presently in the works are completed. 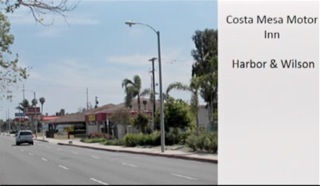 These two slides show the site of the Costa Mesa Motor Inn before the proposed project and after. He had several similar comparisons and, just as they did in the recent Town Hall, they evoked murmurs from the audience. Steve Lamott (sp?) 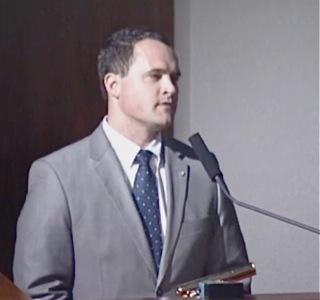 representing the Building Industry Association spoke, telling us that the rate of growth in California has slowed and that the population is aging, with one in five 65 years of age or older. 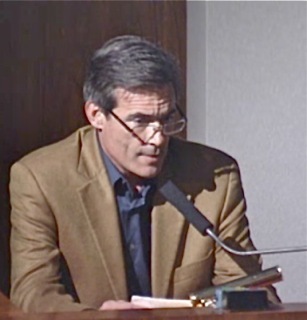 Dr. Richard Mehren observed that the Fairview Park Preservation Alliance initiative to protect the park from development has qualified for the November ballot. Jim Kerins - a member of the Bikeways and Walkability Committee - used his three minutes to speak of the life-style preferences of GenXers and Millenials and eventually alienated every person in the audience over 50 with this statement - which had a very familiar ring to it as he carefully read from a piece of note paper after winging the earlier part of his presentation. 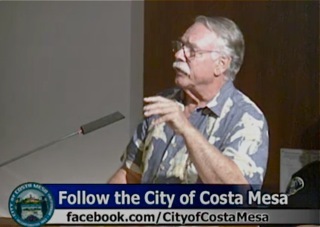 "So, let's not let allow a vocal, selfish minority who won the genetic lottery and was born first to speak for all future generations who desire to live here in Costa Mesa." Well, I'll just assume for the purpose of discussion that he was including me in that group and tell you that I'm pretty darn offended by it! 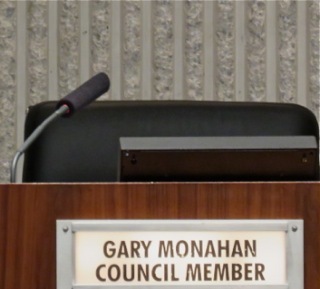 Is he saying us old folks - many senior citizens DO take the time to study issues and speak about them at council meetings - are not entitled to a voice on the future of our city? He's telling us that his parents generation, who worked hard, raised families and created a good life for themselves, are no longer entitled to an opinion on important municipal issues! Well, Jim, here's a message for you. Us geezers pay attention to issues and we VOTE in the highest percentages of any other age group, so don't bother running for office in Costa Mesa - any political aspirations you might have had are toast! 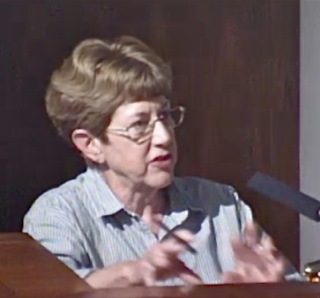 Margaret Mooney observed that there were a lot of dwellings going up with no additional park space and wondered about the council's committment to parks. 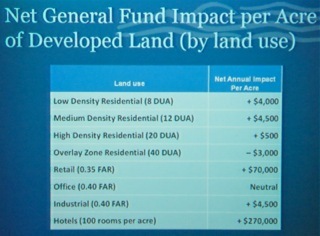 Cindy Black challenged Kerins comments and corrected his math, since he got the percentage of the city affected by the General Plan as proposed by half. 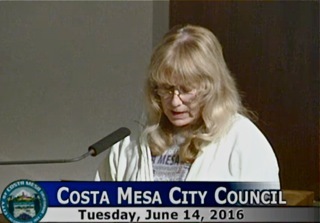 She also suggested that the council watch the recent Town Hall on the Costa Mesa Brief YouTube channel. Anna Vrska was the final speaker and she agreed with the majority of the speakers who preceeded her. 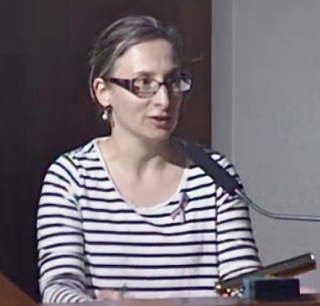 Among the observations she made were about the large number of innacuracies and mistakes in the document - a fact that was mentioned by others, including council members, during the meeting. 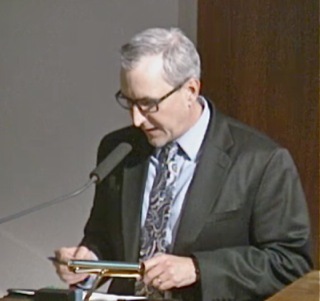 During the public comments Righeimer told a couple speakers who addressed the lack of affordable housing that he wanted to get together with them, so call him. At least he didn't say he wanted a cup of coffee with them this time. Then, for the next 90 minutes the council discussed and dissected the documents. 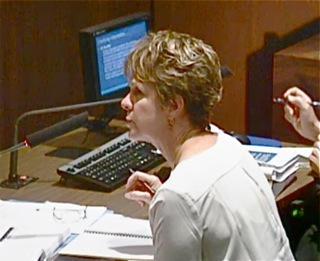 Sandra Genis used some time to plow through the staff report and attached documents, dredging up important details that were problematic. 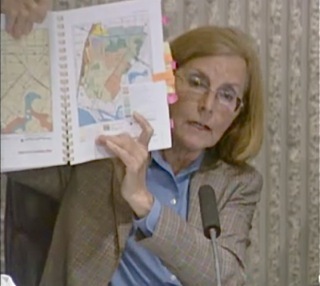 She was concerned about the quality of the analysis in some areas and conflicting legends on some of the maps provided. At one point Foley suggested that she just present the list in order so the staff could compile them for correction. While this was going on both Mensinger and Mayor Pro Tem Jim Righeimer seemed amused and bored at the same time. During the discussion Righeimer said he had watched the Town Hall and found it to be biased and inaccurate. Uh, huh... didn't expect more from him. He then went off on a rant about the changes being proposed are "deminimus" - one of his favorite words - and couldn't understand why folks were getting so excited about it. 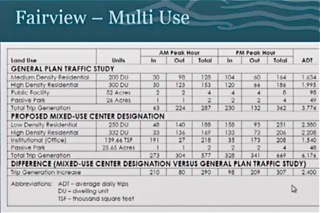 The traffic projections from the previous General Plan have not been met, so he chided the consultant for getting THAT one wrong, and wondered if he's wrong on this one, too. 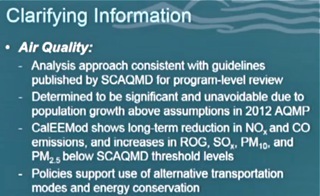 In fact, during that interrogation of the traffic consultant he suggested that, since the traffic projections from the PREVIOUS General Plan update in 2002 had not been met, we should just take that document, stamp it and send it on it's way and not mess with this process! I'm confident that the staff and consultants - who have spent thousands of hours and at least a million dollars on this process - were quite happy with that bloviating observation. BASHING AUNT PEGGY - WHAT A JERK! 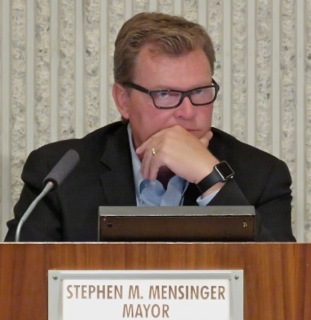 Adding to the cluelessness of the evening, Mensinger went off on a riff about his home town, Modesto, California. You may know that it's located in the north part of the Central Valley and was supposedly the scene of the classic coming-of-age movie, American Grafitti. 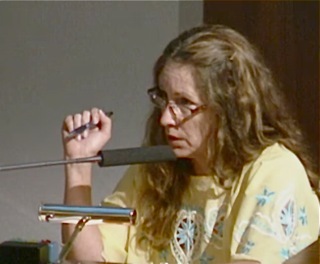 Well, Mensinger told us that his Aunt was a politician in Modesto and she fought development so now Modesto is a mess! Well, I can practically hear Aunt Peggy spinning in her grave. 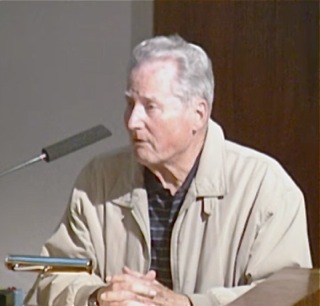 I'm not going to go into this in detail, except to observe that Mensinger's Aunt Peggy is legendary in Modesto - there's a trail in a local park named for her and more. If you're interested, read about her impact on that town HERE and in her obituary, HERE. She was warning about situations exactly like those her nephew is facilitating here! 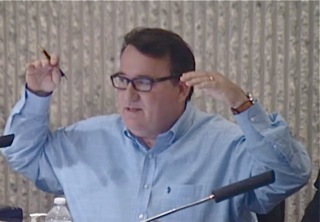 Foley got the floor and began making motion after motion on the items listed on the first page of the staff report and driving Mensinger and Righeimer nuts. It was actually kind of fun to watch. At one point one of her motions was based on a number in the staff report that turned out to be a typo - which made her VERY angry, since there were way, way too many of those gaffes in this document. She told us that the city was completely out of balance. No, she didn't mean the people being off-balance, although... she meant the homeownership vs. renter ratio is way off. We have well over 60% of our residents renting shelter. She wants to create situations where that gets reversed because she thinks owners behave for the long haul and renters tend to just live in the moment. She was not completely successful in the motions she made. 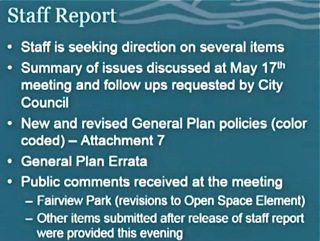 She wanted to "re-order" the ratios of open space and other uses on the Fairview Developmental Center but the council didn't support it. 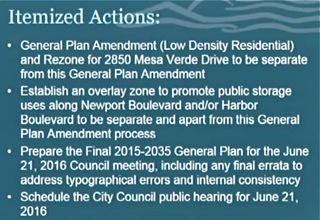 She wanted to remove the residential overlay from Newport and Harbor Boulevards but it also failed. 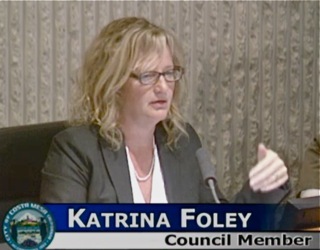 Quite honestly, these motions were coming so fast and furious, and the yapping among the council members - who didn't turn on their microphones - was so distracting, that I didn't get all the votes accurately. Perhaps Daily Pilot stalwart Brad Zint did and will report it for us. Perhaps I can piece it together when the video is available. Sorry about that. 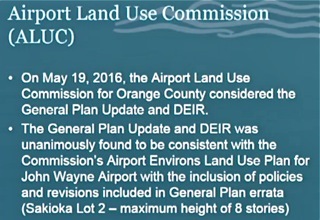 The council will hold another public hearing on this issue next Tuesday the regular council meeting. That probably won't take too long, since it will just be a clean up of some of these issues and they plan to vote to accept the General Plan at that meeting. We'll see. At Genis' suggestion Mensinger adjoured the meeting in memory of those who lost their lives in Orlando recently. Just about everyone knows that Greedy Stevie wants to turn a big chunk of Fairview Park into a sports center and maybe even add houses and condos that his contributors and buddies can build. His Aunt Peggy was loved and admired in Modesto while Steve's branch of the family was still tipping over cows. Aunt Peggy Mensinger was an honored graduate of Stanford. We have yet to hear whether Stevie actually received a degree from USC, or just uses the alumnus label as one who attended but did not graduate. Peggy Mensinger is to Steve Mensinger as Dennis Quaid is to Randy Quaid? I suppose in the long run, if the boyz don't like the smarter ones, the women, spending time making corrections to the plan document, then they should have selected a company that did a better job of presenting a document not rife with "typos" and downright errors. Foolish of Mensinger and Righeimer to make light of the smart ones having to spend time correcting it. 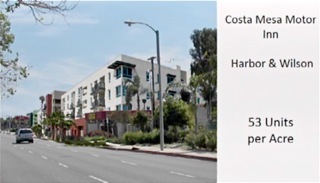 I absolutely do not want to see high density residential along Harbor Blvd. Harbor Blvd. as well as Newport Blvd. should be used for commerce for the residents and visitors. 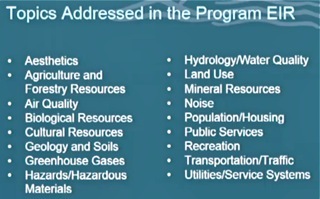 These areas should be restaurants, businesses, retail, and of course, the ever present auto dealerships. Where else would they go? You can't shove all of that above the 405 and hope to find space. Its simply idiotic to turn commerce areas into residential along those thoroughfares. The two bullies continue to bully, no surprise there, but to use your dead aunt as your scapegoat? Really? Even that is a new low. I hope that the electorate recognizes their out and out blatant lack of regard for the community. Here is my prediction if these two get their way. 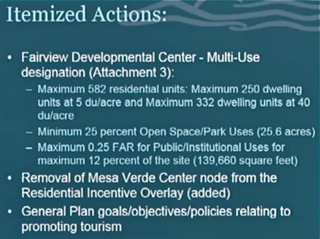 They build out Costa Mesa, gleefully partaking in any "Benefits" they may receive along the way. Once they are done, they will both move on to other less diverse, less dense, less socio-economic challenged communities in order to reap what they have sewed. Just not in Costa Mesa. Gary has officially checked out, which is to be expected, I mean this guy doesn't care about anything in this City except his crappy bar. You'll be old, and grey, and only in the way." I can't believe riggy lied to the public about how traffic generated by people that work here is the same as traffic generated by residents. Residents leave to go to work while the workers drive in. By having the traffic be all residential the cars head the same direction and make traffic worse. The same would be true when residents return. Let's not forget the workers go home on the weekend, wouldn't happen if all residential. 15,000 new cars! How many more miles of permanent traffic is that?! He is ruining our city let's destroy his legacy! His last commentary he lied again, he didn't move here for his kids it was for his appointment. Carpetbagger's claim was as unauthentic as his hair color.